If you are working continuously in your system then you might have some password-prime-does-which-most-password-managers-dont-do/">relaxation. However, there are some problems to mishandle your system from others. In such a situation, you can have this tool as it brings more bitobit-mithril-password-manager-your-privacy-becomes-more-secure/">features for you. 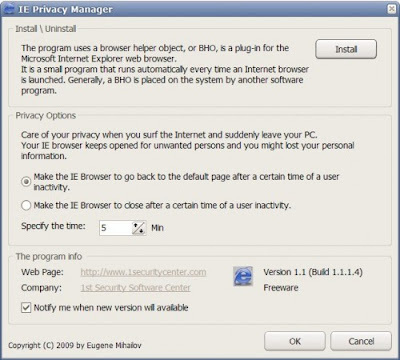 The name of the tool is IE Privacy Manager, which helps you normally from mishandling your systems. If you install this software, it will install a Browser Helper Object in Internet Explorer that can be configured to either make the now-albums-get-more-privacy-in-picasa/">IE web browser revert to the default home page or make the IE browser to close after a certain time. digital-privacy-manager-use-instead-of-entering-passwords-in-your-systems/">Want to know about Digital Privacy Manager ? You can make the how-to-change-network-settings-in-a-moment/">settings as your choice easier and faster than ever. The default time of this tool is set to five minutes and the default action is to go back to the default page of IE. This portable software program is supposed to work with Windows Operating Systems and it is more compatible with the how-to-tighten-up-the-securities-in-windows/">most versions of Internet Explorer. You can download this software directly from here.